The Saguaro Cacti is the cactus that made the Southwest US desert landscape famous. Unfortunately for quite sometime we weren't ensuring the survival of these large and famous cacti. The country long ago protected this land near Tucson AZ as Saguaro National Monument and it officially become a National Park in 1994. The amazing Sonoran desert is the only place in the world that houses these tall and mighty Saguaro Cacti. When we think of the desert this is where our minds go. After all it's the symbol of Arizona but not only does the desert have so much more to offer than the Saguaro; Saguaro National Park has much more to offer than just this cactus. In fact the park is home to two different sections: East and West and they are primarily separated by the city of Tucson AZ. You can head for day hikes galore in the Tucson Mountain District or up the ante with a backpacking adventure in the Rincon Mountain District. Animals, other plants and cacti specials, and more await you. Are you ready to experience the park that symbolizes the state of Arizona? As you can see the Saguaro Cacti can tower over a human! Join co founder of Hashtag 59 Mike R and our resident park contributor (he's been to over 50 of the 59 US National Parks!) Seth B below for some of their favorite adventures in the park and photos along the journey. If you haven't checked out our recent blog on other great hiking spots in Arizona then head HERE to read more about desert adventures. The Mighty Saguaro is only the beginning of exploration in Saguaro National Park. The park is home to lizards (like the one Seth B captured above), the barrel cactus (which Mike R was able to see in bloom on his last visit), cholla cactus, more snakes than you would ever care to know, plus mule deer, flowers, and even a few black bears high in the Rincon Mountain District of the park. The desert is hardly barren and Saguaro National Park is another great example of this! 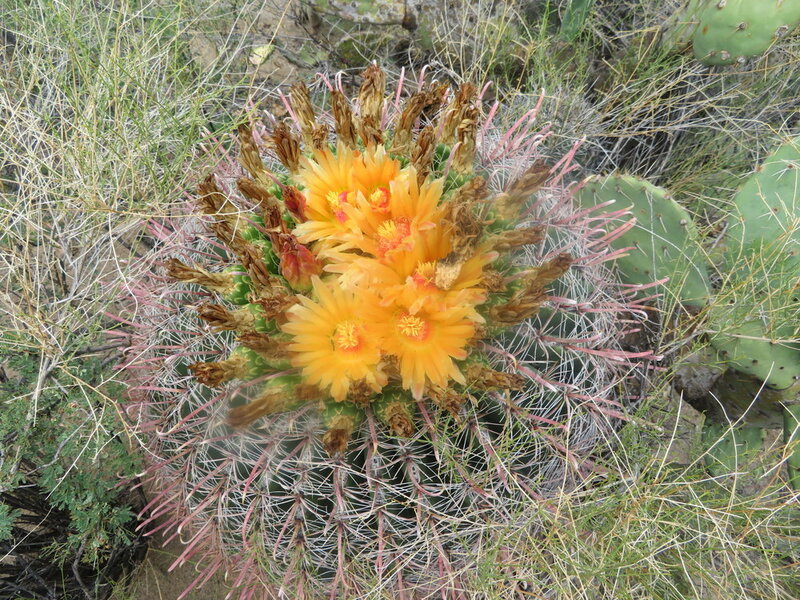 Fall: Great temperatures and the barrel cacti are in bloom! However the rattlesnakes have just mated and are on high alert. The heat of the day is actually the best time to be out and hope to avoid them. Winter: The most moderate temperatures though some of the backpacking up in the Rincon Mountain District will have cold overnight temperatures and possibly snow since you will be up above 8,000 feet. A great time of year to day hike! Spring: Much like the fall only the baby rattlesnakes aren't roaming around accidentally striking you in your ankles. 1. The Hugh Norris Trail in the Tucson Mountain District. It winds up to the highest point of that side of the park at Wassen Peak. (Sunset picture below from Seth B.) It wraps up and around the ridges with outstanding vistas on both sides and allows you to go anywhere from just 2-3 miles to double digit miles. 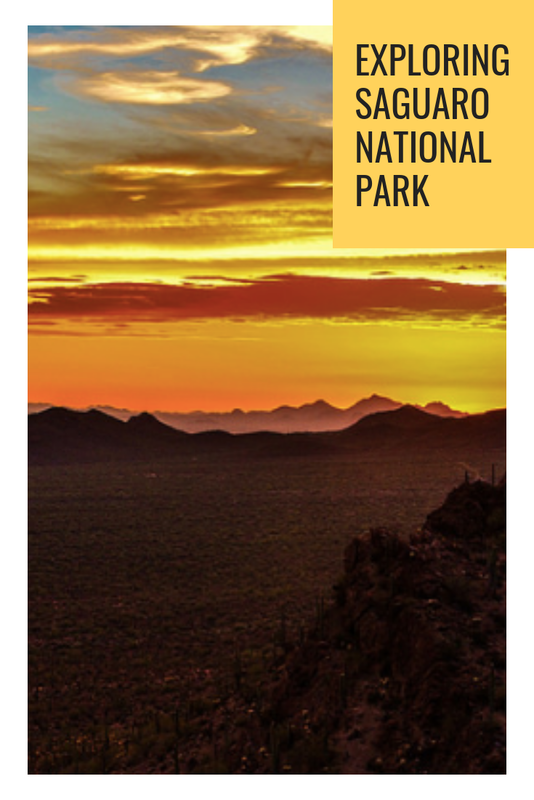 All the Saguaro hiking info can be found here on the NPS site. 2. The Loma Verde Trail hits little elevation but is a great loop trail in the Rincon Mountain District to explore all the various washes and cacti/plants of the region. 3. Douglas Spring Trailhead will take you into the Rincon Mountain backcountry and wilderness. Make sure you snag your permit! 4. Desert Discovery Trail and the Valley View Overlook are great short nature trails for those there only a short period of time, have young kids/the elderly, or looking for a quick stretch prior to something more. Mike R saw Saguaro with several "arms" like this crazy one. While this one has several some of the biggest and oldest can be 50 feet tall, 200 years old, and have close to 50 "arms!" The Modern Day Explorer Seth B snagged this gorgeous sunset pic from Wassen Peak; the longest hike and highest point in the Tucson Mountain District portion of the park! Petroglyphs are located at Signal Hill in Saguaro National Park. It's an important reminder of the history of the area and how vital it is we preserve these special lands. They belonged to the Native Americans long before they were preserved by the National Parks. Respect the petroglyphs and learn from our past in hopes of not repeating it all. Enjoying Saguaro National Park in closing. I would recommend taking one full day to explore the Tucson Mountain District for a longer day hike and picnic plus a ranger chat. Stay the night in Tucson at an AirBnB or hotel prior to a backcountry camping adventure or another full day in the Rincon Mountain District. They are about an hour away from each other so trying to cram them both together in one day would make you feel a tad rushed. It's not one of the more highly populated parks but it's a gem with great hiking, views, and opportunities for adventure. Snag a meal at Saguaro Corners on the Rincon side, check out the Arizona-Sonora Desert Museum on the Tucson Mountain side, and a stop at one of the many fun Tucson Breweries is never a bad move! Special thanks to Seth B for his amazing photos to let my words pack an even bigger punch hopefully for the way in which you view Saguaro National Park. Leave your comments below with questions or share your adventure that you had there! And if you haven't signed up for our emails make sure you do so in the footer. We have events, contests, and new content all of the time and it's the best way to stay in the know.